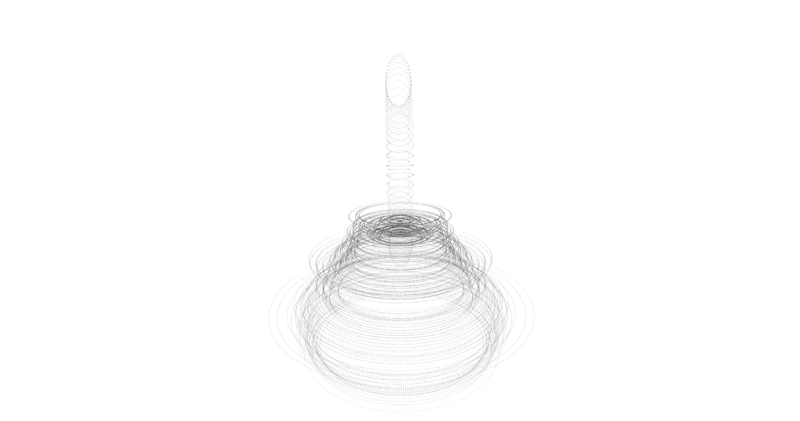 These bells are a recursive series of transmaterial transformations from shape to sound and back again. 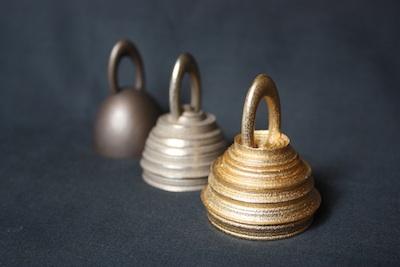 This series of bells titled “the Shape of the Sound of the Shape of the Sound” has been curated by Diana Hare for the Embracing Innovation Vol 2. exhibition at CraftsACT from 24 May to 7 July, 2012. The first bell was digitally fabricated by 3D printing a bell shape designed in a CAD program. The second bell was shaped from the sound of the first bell. The sound is higher in pitch and has an added vibrato effect. The third bell is shaped from the sound of the second bell. The sound it produces is yet again higher in pitch with even more vibrato. The increasing pitch is interesting given that the sound modulates the same fundametnal bell shape, so there is no change in size. A fourth bell shaped from the sound of the third has yet to be fabricated. The next bell in the series…. Will this next bell in the series continue to increase in pitch and vibrato ? You might think this question could be answered by computer simulations. However these shapes are complex and beyond current capabilities of acoustic modelling software. To compute the sound produced by such an object can take hours or even days, and involves many simplifications, yet ringing it produces an immediate result. The series of bells demonstrates an innovative application of digital fabrication to explore and understand the acoustics of complex shapes. The bells are also an innovative application of digital fabrication to explore sculptural forms crafted from sonic material.